This camp introduces kids to the basics of sailing a small boat by putting them in the driver’s seat of an Opti sailboat. An Opti is a very stable boat with one sail so it is ideal for beginners. The main focus of this repeatable camp is the development of basic skills for a strong sailing foundation. Beginner 1 is a good fit for brand new sailors. 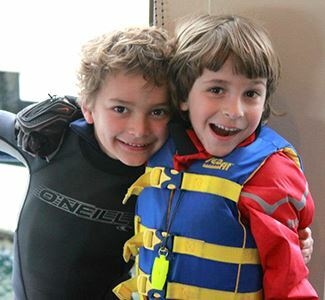 All our sail camps require your child to pass a simple safety check in the water for liability. This safety check is performed during the morning on Monday, and does not require any swimming ability. Please be aware that if your child cannot enter the water, they will be asked to not come back and we cannot offer a refund. This camp introduces kids to the basics of sailing a small boat by putting them in the driver’s seat of an Opti sailboat. An Opti is a very stable boat with one sail so it is ideal for beginners. The main focus of this repeatable camp is the development of basic skills for a strong sailing foundation. Beginner 2 is a good fit for returning beginner sailors. Registrations that are canceled more than 4 weeks before the first day of class will be refunded, less a $25 processing fee. Registrations canceled within 4 weeks of the first day of class will only be refunded if CYC is able to fill the vacated spot, less a $25 processing fee. No refunds will be issued once a class has started. CYC reserves the right to cancel programs that do not meet the minimum number of participants, and will attempt to place participants in an alternate program or, if unable, will issue a refund.